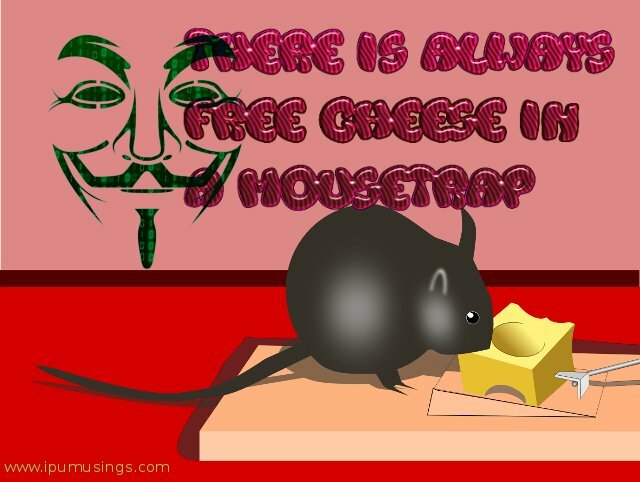 Remember, there is always free cheese in a mousetrap. Such schemes offering you to get rich quickly only make rich those fraudsters who are selling them. They promise you rich returns for a small amount of money as an investment. College going teens are the soft targets and they often fall prey to such scams. Pyramid Scheme to promote Your Web Business/Product: You will be asked to register for a product. You will not sell the product but get more people selling underneath you. More prospective members your have more commission you will get. Ponzi Scheme: The schemester promises you a quick return or high return for an investment. Suppose you invest ten thousand rupees for the first time, within a month you will get 15K or 20K cheque making you happy. Next time you invest 50K expecting 100k which vanishes soon into thin air. Work At Home and Make Millions: After some initial investment you will be given a sales kit, you need to call hundreds of phone calls or fill up web forms at the cost of your telephone or internet bills. Buy Stocks of Unknown Companies: Brokers try to convince you to buy shares of an Unknown company which will soon give you a high return. You must check the broker is registered and the stock company is listed on the stock exchange. Be extra-cautious if the returns are being generated by some investment you never heard of or it sounds too good to be true. Walk away whenever someone offers you such schemes. Remember for ages, the best way to get rich is to work hard and work smartly.